Tony Gee and Partners has been in business for 40 years and from the early days in an office above a launderette in Cobham it has become one of the most respected problem-solving consultants around. Getting there has been an exciting ride as Nigel Yarwood and Neil Farmer explain to Jackie Whitelaw. For anyone considering how to establish a successful company the Tony Gee history is one to study. From the early days to date the underlying business themes of quality engineering, good networking, and a never say never approach have always been what makes it a popular first port of call for clients and contractors. That, and an ability to take advantage of the unexpected. Interviewing former partner Nigel Yarwood and current partner Neil Farmer the phrase “and then out of the blue we got a phone call” recurs with surprising regularity when the pair talk about the history of the Tony Gee consultancy; phone calls which set the business off on new paths and delivered, in some cases urgently needed, new revenues. Yarwood joined the fledgling company early on in 1975 and Farmer in 1988 when staff numbered only 24. The tale they tell, especially of the early days, has all the ups and downs of a rollercoaster, with the tricky problems all resolved thanks to effort, nerve, lateral thinking and good relationships with previous clients; characteristics that are fundamental to the company still today. The firm didn’t start as the fully formed consultancy it is now but designing bits of kit to build bridges and the like. 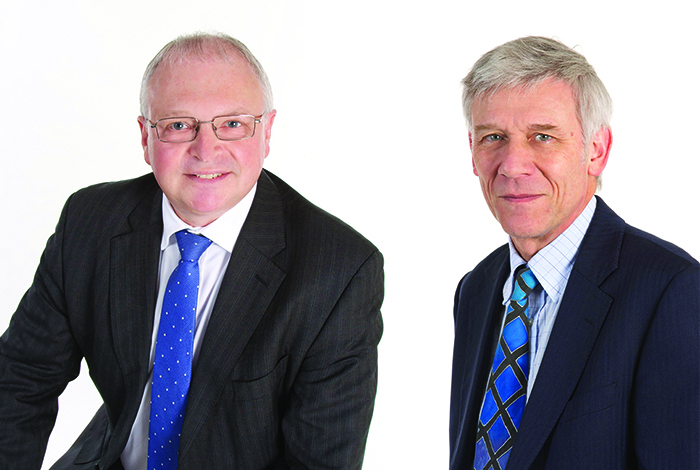 Yarwood arrived for his interview in 1975 to find the founders Tony Gee and Frank Rowley ensconced in their small office “ready to conquer the world”. Early work, the result of a good relationship with a modern engineering giant Jean Muller of PSC Freyssinet, was to do with jacking systems for North Sea oil rigs and, important for the later development of the company, prestressing systems for segmental balanced cantilever bridges. One year after Yarwood joined though and the company hit a difficult patch -– the North Sea work had foundered and Rowley headed to Nigeria. The job in Nigeria was particularly key and was to help contractor Reynolds with the design and supply of a launch girder to build bridges from 25m precast beams. “We had to deliver the whole caboodle, which got us our first functional launching girder. It was all in a good cause. A few months later in 1977 the company won the job for the M180 Trent Bridge balanced cantilever “Eurolauncher” gantry which won a BCSA design award a year later. “That confirmed our credentials as a contractor’s designer on bridges,” Yarwood remembers. “We were also churning out our own bridge designs but not getting anywhere so we opted to sell them on to contractors. Looking back we were developing our USP. Another leading Tony Gee player, Steve Harridge, had joined the business by then and took on the nitty gritty of Orwell. Overseas work has consistently been a mainstay of Tony Gee’s revenue and an opportunity to develop its skills in markets more open to new entrants than the UK. Hong Kong was to be the next port of call, again for a gantry for Costain on the Eastern Island Corridor; swiftly followed by Tsuen Wan for Paul Y. “It seemed to be all about gantries then but being in Hong Kong gave us an opportunity to get into a new area. We won geotechnical work on the basement for the Hong Kong and Shanghai Bank Building – we knew it was going to be iconic and it was great for our reputation,” Yarwood says. The bank job was where Tony Gee came into contact with a man who was going to be a future partner – Bob Spackman – who was project manager for the building’s steel erection. This was 1981 and the 80s gave Tony Gee plenty of opportunity on what became some other iconic structures, though they came with their issues. That was an interesting day and a marker to another of Tony Gee’s USP’s. “The firm doesn’t run away from risk, it is something to be managed, and it was managed at Gade,” Farmer says. 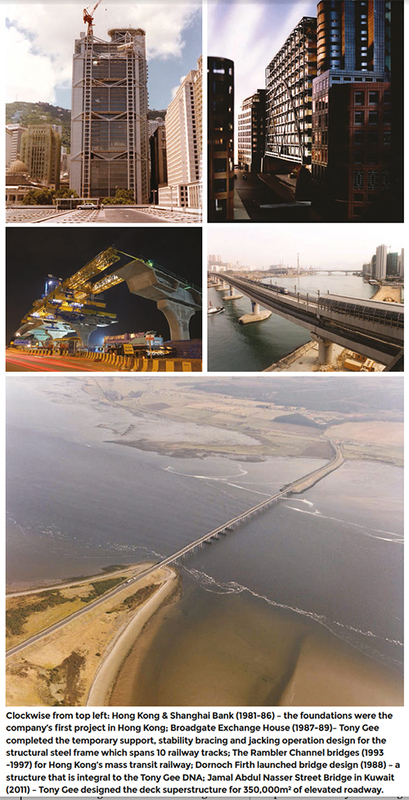 The 80s continued with high spots including the commission for the Torridge viaduct balanced segmental cantilever gantry, several grade separated interchanges in the US and gantries for eight contracts on the Singapore mass rapid transit. In 1986 Bob Spackman joined the firm, with the intention of taking on the business development and marketing. But pretty much as soon as he arrived there were some of those out the blue phone calls and Spackman found himself back on site. "We were now recognised as having great depth in bridge design, but also because Frank had just taken over the business and it was his first big success story." “He’d wanted a change from being a project manager on big steel frames, but we persuaded him to manage Broadgate Exchange – a great big steel frame,” says Yarwood. That was the challenging building being erected across the railway track near Liverpool Street in London. “Hollandia Bovis Schal, the contractor, wanted Bob and we needed that job,” Yarwood continues. Spackman became a partner and went off to the City site for two years. 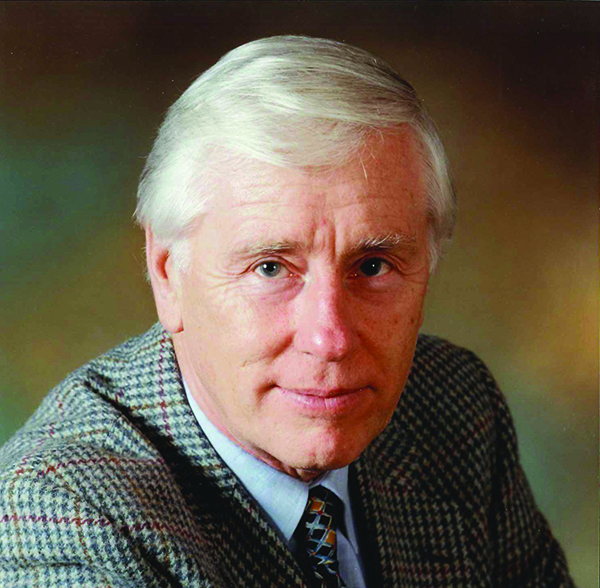 In 1987 founder Tony Gee retired from the UK business to concentrate on interests he had developed in America. Frank Rowley took over Tony Gee, the business, in the UK at that point. Dornoch was significant for another Tony Gee employee – the current boss Graham Nicholson, who was project engineer on Dornoch – and the structure holds an important place in the DNA of the business to this day. Even with this work the early 90s were looking uncomfortable from a business point of view. The firm had expanded in the late 80s boom and drawn down its reserves and then the work virtually dried up. “We’d gone after the Rambler Channel crossing in Hong Kong with Costain but didn’t get it. But as an example of never say never, then came a really memorable moment. Steve Harridge said let’s go and see if Dragages (who had won the job) need any help. “They did. In fact they said, would you like to design it? Apparently they had had the in house capacity to do the tender, but not the detail. Others were chasing it but we won that work and it was huge, bigger than Waterloo. And from there we got the Rambler Channel mass rapid transit crossing. That was all a benefit of us understanding contractors and the work took us right through the dip,” Yarwood says. The slides were moments of high drama. It was a night of heavy rain and the bridge decks were being slid in ‘down-hill’. The brakes were wet and not holding so there was a danger of a runaway bridge moment. “We called a halt,” Farmer says and tightened up the brakes, started again and it all went well.” They were British civil engineering’s largest bridge slides; the replacement viaducts each weighed 5,500t and the work was a national event which featured on TV and was recorded for posterity by the BBC. Meanwhile, Bob Spackman had finished at Broadgate and managed to get his feet under a desk and his mind onto marketing, when true to form, the phone rang ‘out of the blue’. This time, the call was from the Storebaelt East Bridge project in Denmark connecting the country’s islands of Zealand and Sprogø. Contractor Alstom needed help managing construction of the 1624m span suspension bridge superstructure, so Bob was parachuted in for a year and got the job on track with all the cables up and deck coming in before he returned to Surrey. On the project front, foundations for the London Eye and design of the Falkirk Wheel were just a couple of the schemes keeping Tony Gee in the public eye. “And then we got a phone call out of the blue from Lloyds Register!” says Farmer. We were wanted for the Independent Verification and Validation team on Taiwan High Speed Rail. That was a massive job with good serious cash flow even if it was a bit off piste for us. We’re still waiting for the next one of those…maybe HS2?” he suggests, hopefully. There was a huge blow for the business in 2003 when Frank Rowley died suddenly aged 62; Graham Nicholson took over and he has led the business ever since (see interview Infrastructure Intelligence October 2014). “We’ve always done it by infiltration and through using experience on big overseas schemes to demonstrate our worth. And we’ll keep on doing that." From being 100 strong eleven years ago the firm now has over 400 staff and has matured into an organisation that can still react to the big opportunities but with a solid, reliable base of work. Along with rail, highways is now a big earner and the firm is building workload in power and marine. Finding the challenging jobs that require innovation and verve are still at the core of the firm because to keep the good people that give it its reputation it needs the interesting work. The last decade has seen Tony Gee involved in the Naini cable stayed bridge over the Yamuna river in India; lead designer on the Three Mills Lock that allowed opening up of access to major sites in east London from the Thames, including the Olympic site; temporary works for the roof erection of the new Wembley Stadium; design work on London’s first cross river station on Blackfriars Bridge; plus a significant proportion of the East London Line. In most recent memory, it was Tony Gee that was called in by Network Rail and its contractors to design the repair work on Dawlish sea wall and sea cliffs following the major storms of last winter. For the future, just as in the 70s, it is still hard for an SME to break directly into major UK projects. “We’ve always done it by infiltration and through using experience on big overseas schemes to demonstrate our worth,” Farmer says. “And we’ll keep on doing that. There are some big jobs just kicking off in the Middle East for instance. Developing experience abroad is the way forward, I believe.” Tony Gee’s journey into the future promises to be just as exciting as over the last 40 years.